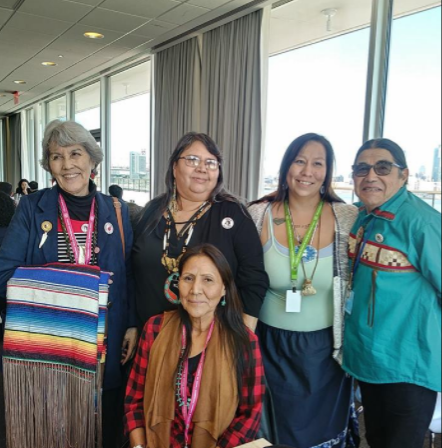 NEW YORK -- The first week of the 17th session of the United Nations Permanent Forum on Indigenous Issues ended on a positive note for the work done by the delegation of AIM-WEST. AIM-WEST youth delegates Thorne LaPointe spoke under item #4; Chief Valentin Lopez spoke under item #8; and Ms. Jean Roach spoke on item #10. The AIM-WEST delegation also conducted a side-event (workshop) on Wednesday, April 18, in the morning to a overcrowded yet up-beat room. But it wasn’t until Thursday that the voice for Human Rights Defender/ Political Prisoner Leonard Peltier was heard loud and clear under item #10 (and response of solidarity overwhelming!). So much solidarity was expressed from the floor for Leonard’s case after Ms. Jean Roach spoke that the Chairperson of the UN PFII Ms. Aboubacrine (Tuereg), had to hit the gavel several times to quiet the room! (see video at 2:32:08). The speaker representing Leonard Peltier at the PFII, Ms. Jean Roach, who was age 14 during the shoot-out at the Jumping Bull compound in South Dakota on June 26, 1975, read her prepared statement and before completing replied to a statement lodged by the USA representative on Thursday toward the NGO International Indian Treaty Council, for speaking about the incarceration and situation of prisoner Leonard Peltier. When governments speak in sessions like these at the UN, an NGO generally speaking, are not allowed to reply, only perhaps in an inter-active dialogue setting. The situation at the UNPFII precipitated by (the) previous intervention fortunately positioned the Leonard Peltier representative (already on the speakers list) to take the floor, allowed/compelled her to defend Leonard’s innocence in the shooting of the two agents by responding/slamming the USA statement, and challenged the USA to their own lies, lies, lies. i.e.. they don’t even know who did the shooting. I might add for your attention; the beginning of this video’s UN PFII session the report given by the UN Expert Mechanism on the Rights of Indigenous Peoples, provides an excellent overview of the current role of extractive industries in a marriage with the military including private security systems (companies) working in tandem against human rights defenders; and worth an ear full! Finally, at the very end of the afternoon session see a plea by a Indigenous sister from Canada to the UNPFII giving testimony of how and who killed her brother as Indian lives don’t matter! Thank you, AIM-WEST Director Tony Gonzales and William Simmons for your professional assistance during our trip to the United Nations in April on behalf of Leonard Peltier. I know the work within the UN moves at a snail's pace which is difficult to understand by some, but, I have a good feeling the results of the trip will be realized in due time. It was an honor to work with you and Jean Roach, and Sage Trudell. I'd also like to extend my gratitude to the Wounded Knee drum group that also attended some of the events. It was energizing as usual.